What should you substitute for fish sauce when cooking? Worcestershire sauce and soy sauce are both options if you follow these instructions. Fish sauce has a long shelf life, but if it has gone bad or you don't care to buy any or you have run out, then you need to find a proper fish sauce substitute. So, check the table below to find a fish sauce substitute. Also listed is a Soy Sauce substitute, but be sure to read the caution** below when attempting to substitute these for each other. It is important to note that substitutions do NOT always work both ways, you can not always read a table backwards to substitute one thing for another and these two products are the perfect example. You can substitute soy sauce for fish sauce, but we do NOT recommend substituting fish sauce when the recipe calls for soy. Remember, when making fish sauce substitutions be sure to measure accurately for best results. 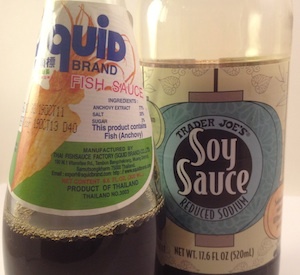 Soy sauce makes a good substitution for fish sauce, especially for vegetarian dishes, but it is NOT recommended to substitute fish sauce when a recipe calls for soy sauce. **CAUTION: Do NOT use fish sauce as a substitute for soy sauce, the resulting recipe will have a fishy taste and be too salty. We hope you found a good fish sauce substitute.